Basler Library staff members Amy Lippo and Jason Penwell took on the task of creating a more visually-driven web page. The new page went live Aug. 15 just in time for the beginning of fall semester classes on Aug. 27. 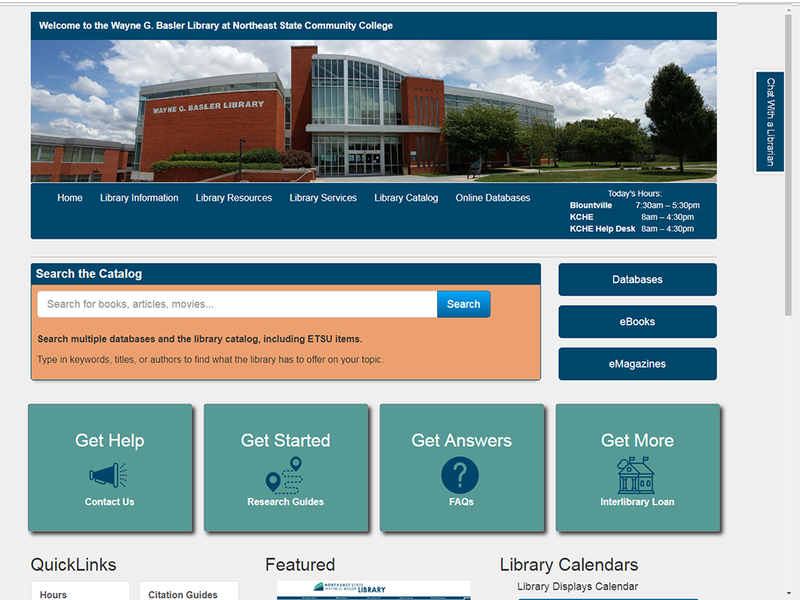 The redesigned Basler Library web page is online now. Patrons can enjoy user-friendly options to search out more than 100 online databases of information. The Library’s catalog offerings through East Tennessee State University (ETSU) and Interlibrary Loan (ILL) remain unchanged. The new page brings access to eBooks and eAudiobooks to the main page for easy access. All the Library’s reference resources continue to expand. A new feature includes a quick link for a student to schedule an appointment with a librarian. The librarians provide help to students on a variety of topics including how to correctly use citations, how to use databases and the library catalog, and how to find sources for assignment topics. Students can also live chat with librarians during Library’s regular business hours to find materials or ask questions. The College’s collection includes DVDs and graphic novels, anatomy and physiology models, and scores of reference guides. Basler Library features a collection of over 70,000 volumes. Students and the general public can request library materials through ILL by filling out the online form on the Library web page. The Library also maintains borrowing agreements with ETSU and the James H. Quillen College of Medicine. Patrons may request materials through the Library catalog or go to the other libraries in person. For students, faculty, and staff, request materials can be sent to the Elizabethton, Gray, Johnson City, and Kingsport campuses. Demas said the Library hoped to implement Zoom virtual technology to conduct videoconferencing with students at other campuses or even at their homes. “Patrons can access our collection easier and have a more direct line of help from our librarians,” said Demas.